Donal was born in Dublin, Ireland. He graduated from the National College of Art and Design, Dublin in 1984 with a BA(hons.) in Fine Art. He is an artist, film-maker, publisher, writer and teacher, and has had a life-long interest in shamanism, the occult and folklore. He moved to London in 1985. Donal has worked as an art therapist at the Maudsley Psychiatric Hospital in South London, a youth worker, painter and decorator and as a pop video director for Chrysalis and Island Records. He was a video artist and technician on cult sci-fi horror film Hardware (1990), directed by Richard Stanley, and created the video cut-up sequences and other visuals effects for the film. Donal was one of the founders and principle polemicists of the legendary Exploding Cinema (1991-1994), a group of cine-activists and pranksters staging anarchic cabaret-style events in squatted buildings, bars, cafés and nightclubs. Extolling a situationist/punk-influenced DIY aesthetic, he designed much of the group’s propaganda including manifestoes, programmes, posters and T-shirts. In 1992 he founded, edited and published Kinokaze, a magazine set up to further the aims of Exploding Cinema. When the group split up in 1994, he continued to publish this magazine, but widened it’s remit to cover an eclectic mix of film, music, art magic, small press, political activitism and squatting. In 1994 he founded House of Skin, a seminal group of multimedia artists working with video, computers, film and slides to create visual extraviganzas at Raves, nightclubs, art galleries and Rock concerts in Britain and Europe. He has worked with a wide range of sound systems and musicians including Spiral Tribe, Bedlam, DIY, The Exodus Collective, Unsound Systems, Travis, Boy George, Dodgy, Shriekback, That Petrol Emotion, Into Paradise and theatre group Blast Theory. For the past 6 years Donal has made a number of trips to the Peruvian Amazon to work and learn from various shamans there, including the internationally reknowned visionary painter Pablo Amaringo. In 2000 he set up the Friends of Usko-Ayar website, to further the educational aims of Usko-Ayar, the Amazonian school of painting in Pucallpa, Peru, originally set up by Amaringo and the anthropologist Luis Eduardo Luna. He has taught English and computer skills to the students at the school. 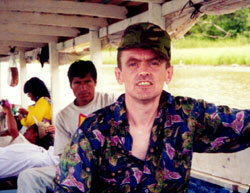 On September 17th, 2001, Donal travelled to Peru for a year. During this time he started to shoot the film Stories on a Stick, which explores the healing practises and mythology of Mestizo Amazonian shamanism through the paintings of Don Pablo Amaringo, and Donal’s own experiences as an apprentice ayahuasquero with Graziella Shuña, a first cousin of Amaringo’s.